As of this writing, The Host is 6th on the NY Times Best Sellers list. It’s been out since May and grabbed the top spot on the list in June. It hasn’t received the same fanfare that Breaking Dawn has, but don’t let that fool you. 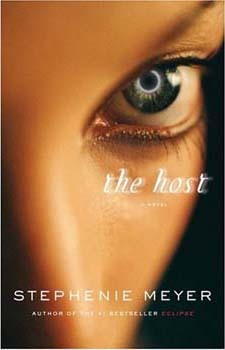 The Host is another fantastic example of Meyer’s singular storytelling and imagination. Set in the very near future, the story begins when the human race has been nearly wiped out by an invading body-snatching alien species. The last humans are barely surviving while being hunted by the alien Seekers. Melanie, one of the few surviving humans, is captured while following signs of her cousin whom she suspects is still alive. Melanie’s body is given to an experienced alien (a “Soul”) but the new inhabitant finds that Melanie is not going to relinquish her mind easily. Melanie and the Soul, who calls herself Wanderer, battle for control. Melanie tries desperately to hide her thoughts from Wanderer, for fear that her memories might lead the Seekers to other human survivors and the people she loves. With The Host, Meyer delivers another page-turning story with surprise twists and unusual situations. It’s a stand-alone novel that’s sure to appeal to most fiction lovers, whether you’re a fan of science fiction, romance or thrillers. I found this novel to be every bit as captivating as Meyer’s Twilight series and can’t wait to see what she comes up with next! If you’ve been living under a rock the past couple months you may have missed the excitement surrounding the release of Breaking Dawn, the fourth (and final) book in Stephenie Meyer’s popular vampire romance series. Though perhaps I shouldn’t be too hard on you if you are out of the loop; I actually came a little late to the party myself, having discovered the Twilight saga only a few months back, before the final installment was released. I devoured the first three books and thankfully only had to wait a short time to read the conclusion. The series is extremely popular among females (ages about 12-112) though I’ve heard a number of guys who begrudgingly admit to being hooked. My husband, a football-watching, beer-drinking, bare-handed-spider-killing manly man, subtly asked me last night when I was going to bring the third volume home for him to read. There is something universally appealing about the series, and if you haven’t read them yet, I envy you the pleasure of sinking your teeth into Stephenie Meyer’s fantastic story. The first book in the series, Twilight, introduces our heroine, Bella Swan, an emotionally mature high school junior, who has decided to move from Phoenix to the small town of Forks, Washington to live with her father for her last two years of school. Shortly after starting at Forks High, she takes notice of the Cullen family, five attractive and aloof teens who are members of the local doctor’s adoptive household. In particular, Edward Cullen intrigues Bella after his bizarre and frightening reaction to her in a class they share. Bella resents his seemingly misplaced dislike towards her until he saves her life in supernatural fashion. Things get complicated as the two realize there are significant feelings between them that cannot be ignored, despite the danger inherent in such an unusual relationship. On the surface, the series may seem like another teen romance story. In fact, the books are full of exciting and unpredictable plot twists and surprises. The characters, including Bella, her father, the Cullens and Jacob Black (who is fully fleshed out in the second book, New Moon) are all fantastically developed and interesting. Meyer has a knack for gently molding her characters so that you can’t help but feel what she hopes you’ll feel towards them, and in that way the books are very emotionally engaging. There are often multiple storylines developing simultaneously and by the final book all conflicts come to a head in an exciting finale. Breaking Dawn is the crowning glory of the series. I remember wondering in anticipation what choices the characters would make in the final installment and fully expecting to be disappointed in some way. Instead I was actually PROUD of Meyer for her commitment to the story. She did not let her readers or her characters down and I had a great sense of satisfaction when I closed the book in the wee hours of the morning. Oh, and the movie Twilight is coming out in November…exciting! !